I happen to be a big fan of white chocolate, both because I like the dairy and vanilla flavors of high quality white chocolate, and because I like how well white chocolate can pair with outside flavors itself. While dark chocolate can dominate a recipe with its intense, strong flavors (not a bad thing, of course), white chocolate is much more subtle and you can layer a surprising amount of flavor in with it. 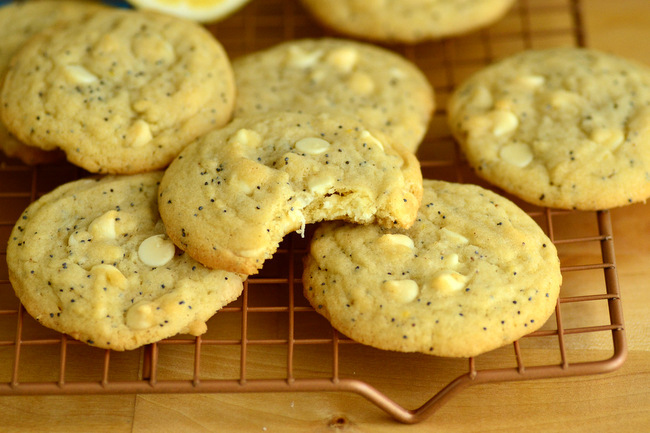 These Lemon Poppy Seed White Chocolate Chip Cookies are a great example of doing something just a little bit different with white chocolate – and as to just how tasty it can be. The cookie dough starts with two forms of butter: melted and softened butter. Melted butter contributes to the tender chewiness of the cookie, while the softened butter (which is creamed in as you would do in any cookie recipe) adds a little lift and keeps the cookies from being overly dense. A small amount of white chocolate is melted into the butter, adding sweetness and a bit of extra vanilla flavor to the dough. It is important to cool the melted butter completely before using it, as it could melt other ingredients if it is too warm when you start to assemble your dough. 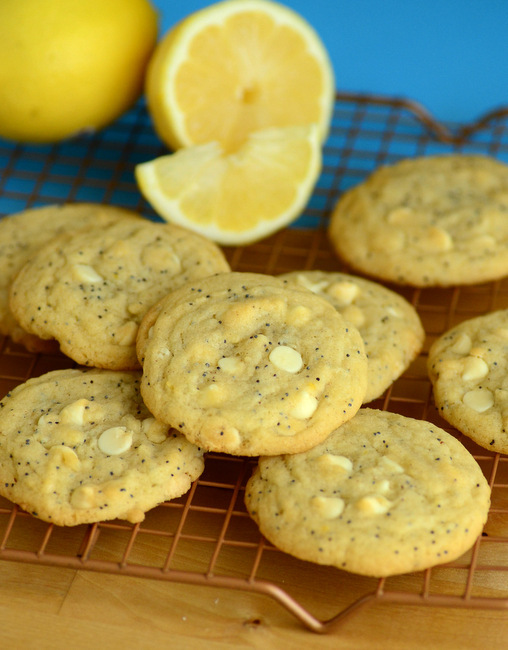 Vanilla extract and a generous amount of lemon zest are also added in, while poppy seeds and white chocolate chips are stirred into the dough just before shaping the cookies. Use high quality white chocolate that is made with cocoa butter and not with other vegetable fats for this recipe. White “baking chips” are too sweet and don’t melt particularly well. I probably sound like a broken record saying this again, since I mention it in every post I write about white chocolate, but it’s always important to use high quality ingredients and white chocolate can be incredibly disappointing when you use the “fake” stuff. High quality white chocolate, on the other hand, can be outstanding. Poppy seeds are so small that you typically need a lot of them to bring a substantial amount of texture into a recipe. In this recipe, you’re going to get a subtle crunch from the poppy seeds, but they don’t add enough crunch to take away from the tender and slightly chewy overall texture of the cookies. I like that you can still enjoy the cookie dough and the melting white chocolate chips without too much crunch, but if you’re in the mood for something with a little more bite (dare I say, something seedier?) you can actually bump up the amount of poppy seeds in the recipe dramatically without having to alter the baking time at all. The cookies should have a hint of brown to the edges, but should still look slightly soft in the center when you pull them out of the oven. The cookies will continue to cook for a few minutes on the baking sheet as they cool, so taking them out before they brown too much is important to ensure that they don’t over-bake. The cookies will keep well stored in an airtight container for a few days after baking. Preheat oven to 375F. Line a baking sheet with parchment paper. In a medium bowl, whisk together flour, baking soda and salt. In a microwave-safe bowl, melt 1/2 cup of butter with 3-oz. white chocolate, stirring until mixture is smooth. Allow mixture to cool to room temperature. In a large bowl, combine remaining 1/2 cup softened butter with the (room temperature) melted butter mixture and sugar. Beat until light and fluffy. Blend in eggs, adding them one at a time, followed by vanilla extract and lemon zest. Stir in the flour mixture with the mixer on low, then fold in the white chocolate chips and poppy seeds until well-distributed. Shape dough into 1-inch balls and arrange on prepared baking sheet, leaving about 2-inches between cookies to allow for spread. Bake for 10-11 minutes, or until cookies are lightly browned on the outside and just set in the center. Allow cookies to cool on the baking sheet for 5 minutes, then transfer to a wire rack to cool completely. I love the combination of lemon and poppy seeds. These white chocolate chip cookies look and sound so unique and absolutely delicious!